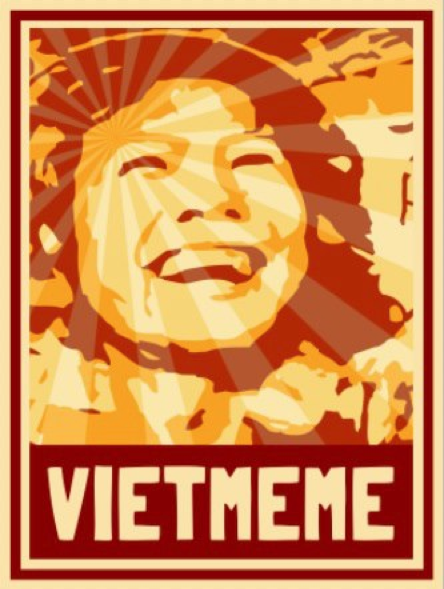 Shortly before the end of 2013, we published the first of a three-part interview with Patrick Sharbaugh of Vietmeme, focusing on civic life in Vietnam as seen through and influenced by the web. We continue that discussion with the second in our series, looking at censorship and surveillance within the country. Some of the dates referenced in this article come from the date of the interview–in November 2013. See Part One here. Ben Valentine: I know that in late 2009 it appears that the Vietnamese government began blocking Facebook what’s the effect of that block been? Patrick Sharbaugh (PS): Vietnam quickly discovered that the block is tissue-paper thin, easily circumvented using any number of simple software solutions (e.g. Hotspot Shield or Tor Browser) or by using an open DNS system like Google’s. Although that block is still technically in place today, Facebook now claims more than 22 million local members (or 71% of the local Internet population) and growing; in fact, Vietnam is Facebook’s fastest growing nation. 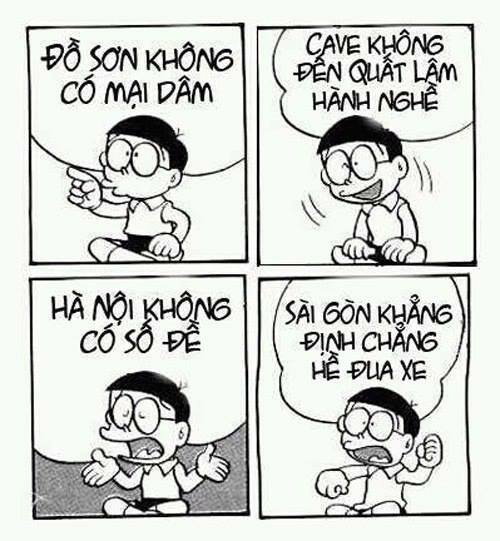 So while American teens and young adults are abandoning Facebook in droves for alternative social networks like Twitter and Instagram, the Vietnamese are pouring in, despite it being ostensibly blocked. And they don’t use it only for posting personal information, but often for creating temporary civil society communities and advocating for pet causes. A Facebook page will pop up one day decrying a low-level government official or a crazy new traffic law or calling for signatures on a petition to advocate for some person or cause. And people will post scores of remixed photos and images and manga that subtly mock the issue or ridicule the person in a way that requires razor-sharp pop-culture sensibilities to understand, and the page will collect a few thousand Likes. And then, two or three weeks later, it’ll be gone. They made their point, and nobody wants to get too carried away. It’s a great example of what Ethan Zuckerman calls the ‘cute cat theory of digital activism.’ By using the seemingly innocuous tools of remix culture and massively open sharing platforms, citizens are able to create and participate in an active public sphere of indirect political commentary and debate that appears on the surface, and at the level of the individual post, to be just about having fun. But taken as a whole, it adds up to a level of civic engagement that is unprecedented for a nation in which traditional civil society has long been proscribed. BV: I read a study from Freedom House that found that of Asian countries, Vietnam had the second least free internet, before China. Can you talk about the censorship and surveillance online there? PS: Vietnam’s Communist Party has a similar view of the Internet as China’s Communist Party: it’s a love/hate/fear relationship. But compared to China, Vietnam’s Internet is vastly more open and unrestricted. China’s Great Firewall is a staggeringly large and sophisticated machine comprising tens of thousands of employees and tight lines of communication among hundreds of organizations and departments. Vietnam has nothing remotely like that. A few dozen websites are sporadically blocked: Facebook, as I mentioned, starting in 2009, and occasionally international media sites like The Economist or BBC Vietnamese or VOA, though not always. More recently, WordPress has been hard to reach sometimes — a result, presumably, of a firestorm late last year over a handful of blogs focused on revealing government corruption, which were very publicly denounced by the prime minister as the work of foreign ‘reactionaries.’ And of course official media outlets, which are all state-owned, are very tightly controlled by the Propaganda Ministry, which includes their online presences. But the majority of Vietnam’s efforts to restrict and manage content on the Internet is focused on what it deems existential threats to Party control from bloggers and other activists. There are currently more than 35 bloggers behind bars in Vietnam, more than in any other country on earth with the exception of China (which has 16 times Vietnam’s population). Speaking out against the party or the state on the Internet is very dangerous, and there are many layers of pressure that can be brought against those who do, and their families and friends, to try and stop it. This has been going on since the middle of the last century, of course; what’s different now is that social media allows the formation of communities around these people and ideas, communities that can be quite large, even international. And the State no longer has complete control of the narrative; theirs is just one in an increasingly crowded field of competing perspectives on the current state of Vietnam and events on the ground. 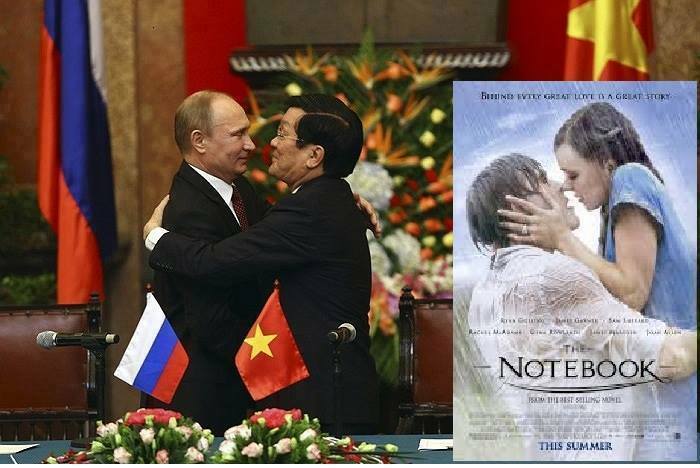 Russian President Vladmir Putin and Vietnamese President Truong Tan Sang, a love story. 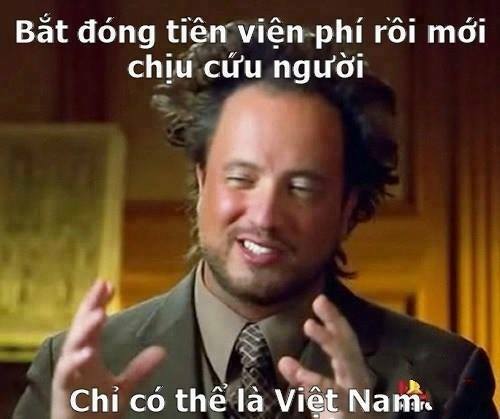 Image from Vietmeme. So we see more and more citizens trying to use these tools to speak truth to power. Just recetly a 30-year-old man was convicted of using Facebook to campaign for the release of his brother, a government critic who’s been jailed for handing out leaflets. He was found guilty of using the social media site to criticize the government. Interestingly, he received a 15-month suspended sentence, which is considerably more lenient than one normally sees for such charges. One interesting thing about that trial is that the charges all stemmed from Article 258 of the penal code, ‘abusing democratic freedoms.’ There’s nothing unusual about that in itself, but it does point up the fact that since the passage of Decree 72 last year, at the beginning of September, there’s not been a single sign of its enforcement [as of November, the time of this interview], although surely this case would have presented an easy chance, if that were the new law’s real intent. 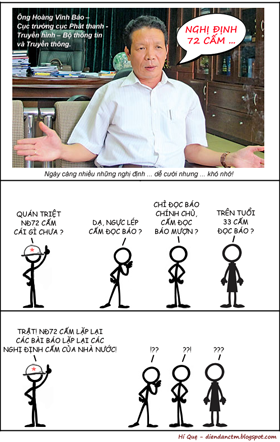 When Decree 72, a slate of new Internet restrictions, was first announced on July 30, a close reading of it showed that it appeared to prohibit Vietnamese social media users from sharing any information, or posting links to information, that did not relate strictly to their own personal lives. Yet after the explosive reaction from local users and the international community, Vietnamese officials hastily assured everyone that the seemingly precise words in the Decree had been ‘misunderstood’ and that they intended only to prevent the wholesale theft by social media users of legitimately reported but unattributed news content. In other words, they implied, Decree 72 was meant to protect intellectual property, nothing more. Still, as Clay Shirky has observed, authoritarian governments stifle communication among their citizens because they fear, correctly, that a better-coordinated populace would constrain their ability to act without oversight. And, indeed, that’s precisely what we find is happening in Vietnam, as we see with the example of the Health Ministry, as well as many others. So it’s a safe bet that some of the thinking behind Decree 72 was that it could be wielded as a tool to tamp down speech the state finds inconvenient. That it hasn’t been used in that manner yet (or at all, to date) is no guarantee that it won’t be. Whether we’ll see anyone called out under the decree for posting a link to a Tuoi Tre news article on their Facebook page seems, however, increasingly unlikely, as Tuoi Tre and many other major Vietnamese newspapers seem to encourage just such activity by posting links for every article and news report to their own Twitter feeds and Facebook pages. The news ecosystem in Vietnam, at this point, appears so fully integrated into the social media ecosystem that disentangling the two would appear pretty close to impossible.